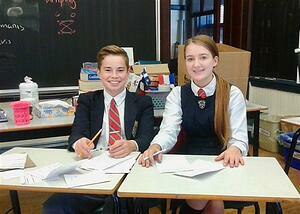 The last three weeks have been a whirlwind for Grade 8 student William Ahern. After a year of debate practices and tournaments with the King’s-Edgehill School debating team, William, and his debating partner Grace Gallant, qualified for the Junior National Debates held in Calgary, Alberta. At this national debating tournament, William and Grace competed for two days and placed in the top 20. In the days prior to debating nationals, however, William showcased his musical talent in the Annapolis Valley Music Festival, which is an annual music festival held in Wolfville, Nova Scotia, involving over 3000 competitors of all ages and musical disciplines. William entered into four advanced piano disciplines (grade 9 and 10 Royal Conservatory of Music (RCM) level music) and claimed first place in each. Furthermore, he was awarded the “Acadia University Rose Bowl/Mary Montgomerie Award”, which is an engraved bowl given annually to the most outstanding performer in any one discipline who has achieved the highest average marks in three or more solos; the “Senior Piano Trophy” for having a consistently high standard of solo performance in a number of classes; and the “Hester Jackson Baroque Award”, which is an engraved shield that recognizes excellence in baroque performance. A video is available here of his award-winning performance of Liszt’s Consolation #3. Watch his winning performance. William’s interests not only span the arts, but also stretch to encompass the sciences where he is currently attending the Canada Wide Science Fair at Carleton University in Ottawa, Ontario. His project is entitled “Fruit Flies Away”, and proposes a new innovative, cost-effective, and environmentally friendly method for eliminating fruit flies. Congratulations to William for striving for excellence in each of his recent achievements and for role-modelling King’s-Edgehill School’s Be More motto. Achievements like this make parents so proud! We find that most parents of King's-Edgehill students are happy to help out whenever they can, and are eager to answer any questions prospective parents might have. 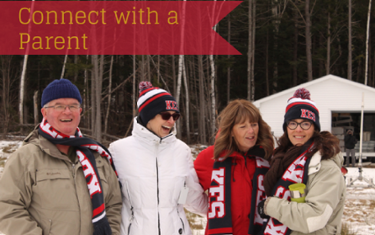 Let us know you'd like to connect, with a current KES parent!